New figures released today by Ofgem debunk the argument that 'green taxes' are responsible for rising energy bills, showing that the proportion of bills attributable to 'environmental and social' costs has fallen since the beginning of the year. "Higher gas prices have been the main driver of increasing energy bills over the last eight years. As the graph below shows, Britain enjoyed a period of falling gas prices until 2004/05. This is the year that Britain first imported more gas than it produced itself. 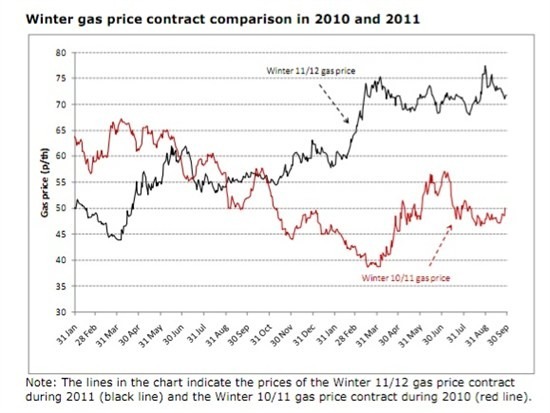 Becoming more reliant on imported gas has meant that British gas prices have become increasingly influenced by global events..."
According to the Ofgem figures, as of this end of September the price of this winter's gas is around 40% higher than last winter's. 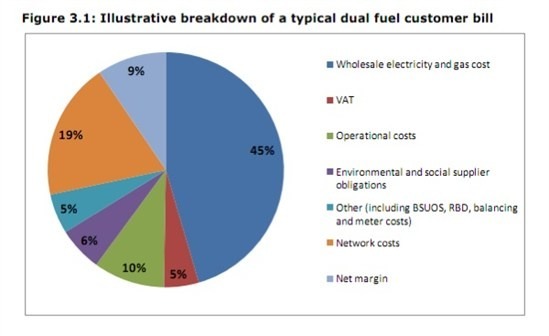 The Ofgem Electricity and Gas Supply Market reform report, available here, shows that as the average bill has risen, the proportion of the average energy bill consumers pay in 'environmental and social supplier obligations' - (what some like to call 'green stealth taxes') - hasn't kept pace, falling to 6% (p.16) of an average dual fuel bill, down from Ofgem's previous assessment of 8%, which was made in March 2011. "At the moment, the cost of Government environmental and energy efficiency programmes adds around £100 on to the average energy bill of £1,300." Ofgem also note that "greater reliance on non-fossil fuels such as nuclear and renewables, could reduce Britain's dependence on gas imports." This is ground that we have covered fairly extensively already, but the Ofgem numbers are important because they are regarded as an authoritative assessment of the costs of energy to consumers. It's ironic that Ofgem's assessment shows it's the rising price of gas which is causing fuel bills to rise, given that this is the very fuel promoted by the climate skeptics who have been the most vocal in blaming green policies. Many of the alarming news pieces that have suggested or implied that green policies have been responsible for rising energy bills have turned out (charitably) to be based on rather peculiar interpretations of research into energy prices. The Daily Mail's campaign on green taxes and energy bills - apparently dreamed up at a lunch between Paul Dacre and ex-chancellor and climate skeptic lobbyist Lord Lawson - relied heavily on figures from Lawson's Global Warming Policy Foundation (who also put their resources towards extolling the virtues of gas). They argued that an average household paid up to £200 on their energy bill for 'green taxes'. This figure was never sourced, despite receiving extensive attention in the Mail, and the paper corrected it after we complained to the Press Complaints Commission. Once again, the figures from Ofgem show this coverage to have been highly inaccurate and misleading, at a time when rising household energy bills are a source of concern to many. The current structure of the energy market also seems to have created a window of opportunity for power companies to rake in significantly more money from their customers - the report also shows a 'significant rise of the net [profit] margin on supplying a typical, standard tariff'. In other words, the amount energy companies currently make out of their customers is currently at a very high level, although Ofgem suggests that it is likely to fall over the coming year. Ofgem are currently investigating energy company profits.